Nancy Poole’s Studio, Toronto, November 10-22, 1990. Joan Murray, “A Treasury of Tom Thomson”, Vancouver, 2011, pages 2-26. David Silcox and Harold Town, “Tom Thomson: The Silence and the Storm”, Toronto. 1977, pages 53-56, 101-107 and 206. According to Thomson historian, Joan Murray, Thoreau MacDonald identified himself as the subject of this artwork, providing the information to the original Toronto owners of “Daydreaming”. This painting will be included in Joan Murray’s forthcoming catalogue raisonne of Tom Thomson’s work. 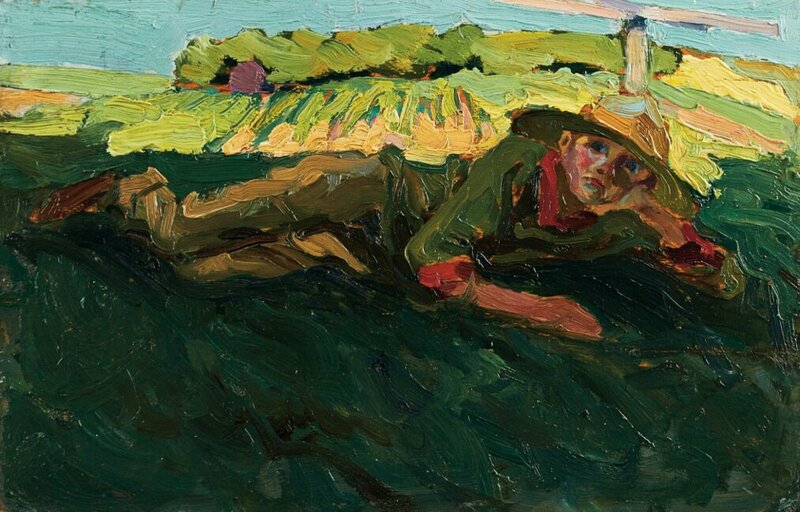 “Daydreaming” is a unique and special work by Tom Thomson, providing a glimpse not only into the abilities of the artist amidst a period of soaring confidence and expression, but also into the life and important personal relationships for the storied painter. Tom Thomson’s connection to J.E.H. MacDonald was a vital one for the artist. MacDonald was the senior artist at Toronto’s Grip Limited where Thomson would begin employment in 1909 and it was through this employment that Thomson would take part in his earliest sketching trips, including his first visit to Algonquin Park. Although only four years older than Thomson, MacDonald’s role as a senior and internationally trained artist provided invaluable guidance and encouragement to Thomson, who had received less structured artistic instruction and relied upon his colleagues for exposure to the movements and philosophies gaining steam outside of Toronto. One of the only instances of clear portraiture since his days as a student, one can appreciate and theorize the possible details surrounding Thomson’s choice to portray Thoreau MacDonald, the son of J.E.H., in such a fashion. It is likely that Thomson not only had a relationship with the boy, but also witnessed strong parallels between their upbringings. Both raised on farms within loving environments of encouraged artistic expression, Thomson and MacDonald were exposed to the beauty of their surroundings and demonstrated their abilities in its portrayal early in life (beginning in the 1920s, Thoreau MacDonald’s own career and history in Canadian art would begin). Thomson’s care and time in creating the portrait is evident, not only in the perceived complexity of the composition, but also evidenced by the artist’s initial pencil sketch on the reverse of the board. The boy sitting in much more of an upright state, the sketch provides clear detail of Thoreau’s face, a revealing aspect of the care given to the depiction, a definite contrast to the frequent “facelessness” encountered when individuals are included in Thomson’s landscapes from this period towards the end of his life. Reminiscent of the period for the painter, “Daydreaming” showcases Thomson’s “thick, full stabs” of brushwork, as well as his “acute sense of colour”. As the boy reclines in the cool shadows of the foreground, within thick grass of endless varying hues of green and black, the sun casts its warm gaze upon the textured landscape of rowed fields toward the horizon and the glimpse of the soft blue sky. Thoreau himself rests comfortably in the centre of the work, his earthen-toned attire giving way to the stark red shirt visible around the boy’s neck and cuffs, highlighting his healthy and colourful face, protected from the strong sun by his wide-brimmed hat. The portrait is the depiction of comfort and contentment, the painter and sitter both sharing admiration not only for their environment, but also in each other’s ability to communicate that connection. Following the untimely death of Thomson, J.E.H. and Thoreau MacDonald’s special relationship with the artist showed perhaps its greatest depths as J.E.H. and Lawren Harris began acting as “trustees of Thomson’s legacy”. Harris and MacDonald organized the remaining artwork by Thomson still housed at Toronto’s Studio Building, categorizing the works and stamping those pieces which Thomson had never signed (using a stamp which J.E.H. designed and created). Thoreau also took part in the stamping of the works with his father and the undertaking of the project by the artists led to Thomson’s work being purchased by Canadian institutions, prominent Canadian collectors and held in the collections of colleagues and friends of Thomson, the process creating a definite foundation towards Tom Thomson’s recognition as one of Canada’s most renowned artists. We extend our gratitude to Thomson historian, Joan Murray, for her assistance in the researching and cataloguing of this artwork.